490 million and counting – this is how many global users have installed and are using Avira Antivirus for their computer systems. This comes as a small wonder, because Avira was named the sixth most popular antivirus provider in 2012. A German company with offices in Japan and China and a facility in the United States, Avira offers – besides antivirus programs –cloud services and software solutions for various computer systems and networks. The company also offers security solutions for smartphones and different operating systems such as Android and iOS. Known for its free basic antivirus solution, Avira continues to improve and innovate its services, thanks to the over 500 experts under its employment and the leadership of CEO Travis Witteveen. Avira Antivirus Pro (from $31.99/ year). This package delivers real-time virus detection and protection, online security and data and identity security while providing you a secure home network. Avira Internet Suite (from $40.99/ year). This package provides all the features of AviraAntivirus Pro plus PC optimization tools like extra memory, data privacy and PC deep-cleaning. Avira Total Security Suite (from $109.99). This package is a combination of the first two, plus a VPN suite that includes traffic encryption, Wi-Fi security, masked IP addresses and even a feature that bypasses geo restrictions. If you want an antivirus that’s easy to install and use, you can never go wrong in choosing Avira. Regardless of the package, you are guaranteed an interface that is clear, straightforwardand easy to understand and use. Through the intuitive interface, you would be able to navigate through andconfigure the system so it functions the way you want it to work. You can adjust and modify your settings for real-time protection, firewall, mail security and other features. However, Avira antivirus has a downside: you need to install different programs to update the driver and to speed up the system. While the installation is not really difficult, users must be aware of this before they purchase the software. In terms of reliability, Avira is software that delivers. Considered one of the best antivirus programs in the market today, Avira has been proven very effective in catching cyber threats even before they get into your computer system, thanks toits strong and powerful antivirus shield. In the event that some viruses do get in, they still do not stand a chance of getting deep into your system because of the robust virus detection and removal feature every Avira antivirus package comes with. Should you need support with regard to your software purchase, you will find a lot of help from the Avira website: a Q and A section dedicated to common issues, video tutorials,manuals, and even a virus lab that has a list of known virus definitions. You can also refer to the social media sites of Avira, or send the Avira team an email or get support by phone. Should all of these fail, you can opt for paid expert support. The Avira website has a directory of experts you can get in touch with, and a dedicated page that lays out all the terms and conditions about hiring an Avira expert. High detection rates and effective real-time antivirus protection: these are what Avira promises and delivers. Of course, something as good as this could only come at a high price, and Avira does. Though not the most expensive antivirus available today, Avira is more expensive than most antivirus solutions in the market. 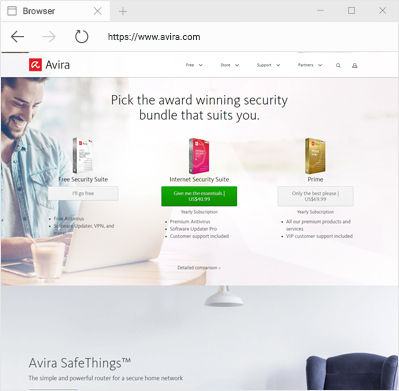 If you have money to spare, we suggest you get Avira so you can enjoy not just the powerful antivirus solution Avira offers, but also the other additional features you normally would not find in other antivirus brands. Like other antivirus packages, Avira also has a 30-day money back guarantee, so if you feel like the antivirus is not for you, you can get a refund, without questions asked. Spyware and Malware Scanning. This feature lets users choose the kind of scan they want to runin the computer system. A full system scan? A quick scan? Do you wish to do manual scanning or just let the software do regular automaticscreening for threats? You can configure all of these according to your preferences. Advanced Internet Protection. The antivirus software does not just come with a virus scanner and cleaner; it also has a feature that protects your computer system against malicious downloads, email attachments or cyber threats you can get from shopping online. One Click Configuration. This allows users to adjust the software settings for either standard or expert levels. Powerful and Robust Firewall. This feature takes care of all the activities of your computer system, be they incoming or outgoing. The firewall acts to protect your computer from harmful attacks. If you are looking for a robust and effective software and have the money to spare, then we suggest getting the Avira line of antivirus software. You can choose the kind of protection you want and the kind of add-ons you prefer from among the different packages Avira offers. While Avira can be wanting in some aspects, especially in terms of performance, but overall, Avira is still a good antivirus program to have, thanks to its additional features and functionalities that do not come with other providers that are currently in the market.